LondonJazz News: For people who don't know you, explain who you are and what you do ? Ed Babar: I am a double bass player and music educator. Having studied both classical music and jazz, as well as completing a masters in education, I have a varied playing and teaching career. I'm fortunate enough to work with the fantastic harpist/vocalist, Tara Minton, both on her own project and in the gypsy jazz group, Harp Bazaar, and have also recorded albums for Tim Boniface, the '40s group The Bevin Boys and the Three Belles, and the contemporary ensembles Mimika and Circuit. I also play with some small classical chamber ensembles, as well as having some fun pop function work on both double bass and electric. At the moment I am teaching one-to-one double bass and some small ensemble coaching at two lovely independent schools in South West London, as well as workshop leading with the songwriting group Be Creative Music. 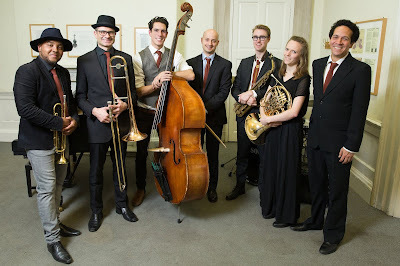 I am predominantly interested in working with large groups of primary school children and teaching them about jazz and in 2016 I formed the Blues and Roots Ensemble (www.bluesandrootsensemble.com) a band dedicated to sharing the music of Charles Mingus through live performances and education projects. LJN: What were the steps that led you personally to want to be a such a champion of Mingus? EB: I think that it is a rite of passage for every bass player to spend time studying Mingus, and I was no different. Although his playing is outstanding (I still consider him to be the finest jazz bassist in history) I was more struck by his compositions and the eccentric personality behind his writing. Mingus’ music always seems to have been written with a purpose – about something or to someone. His writing was intensely personal which was dangerous for a man who took criticism so much to heart. He produced an astonishing breadth of work, both in the sheer volume he produced and the variety within his writing. There are many lessons that can be taught from the manner in which Mingus approached his writing and his performances. He encouraged all of his musicians to bring their own individual voices to the ensembles he led and he made sure they were all properly featured. Mingus also advocated collective improvisation and long open solo sections which encouraged great amounts of interaction and gave the music its spark. He was also deeply political in his writing and is a perfect example of wordless music giving a man a voice within society. You can almost trace the turbulent history of American through the 1940-70s just through Mingus compositions. I have been researching Mingus for over a decade now, using his music as the main focus in both my undergraduate and postgraduate studies, and I still feel like I’ve barely scratched the surface of all there is to explore about his music and about him as a person. Mingus struggled with his mixed race and seemed to fall through the cracks of the disparate communities in LA during his childhood in the 1920s-30s; as much as anything his music is a search for understanding of his own identity. LJN: Who's in the band? Flavio Li Vigni – drums. We have also been fortunate enough to have some amazing guest players on the project including Tommy Andrews (woodwind), Michael Chillingworth (woodwind) and Pete Lee (keys). All of the members of BARE come from different musical backgrounds and bring their unique styles to the project and it’s been exciting to have them all blend together when we perform. LJN: Did you start with one favourite Mingus album in particular? EB: I started with a few compositions that I wanted to feature and most of the music comes from albums between 1957 and 1959 including Live at the Bohemia, Blues and Roots and of course Mingus Ah Um. As the project has developed we have begun to include some of his later and more challenging works. LJN: Do you keep adding to the repertoire? EB: I let the set settle for the first few gigs as there was plenty to get stuck into but now I try to bring one or two new arrangements to every gig that we have. EB: I have written all of the arrangements so far (with the exception of a 32-bar shout chorus written by George Millard). I already had all of the players lined up when I began arranging for the project which made the process easier. The arrangements are far from prescriptive and leave plenty of space for interpretation – part of the fun of the project is hearing how the music can be interpreted from gig to gig. The more we play together the more the guys seem to push the boundaries of what they can get away with within the music and it always makes for entertaining gigs! LJN: You are busy doing schools workshops – here has that taken you so far? EB: It started in the summer of 2016 when I piloted workshops in three primary schools that I led by myself, working with 60 pupils for a day at a time. In 2017 we were awarded some Arts Council funding through a project with Merton Music Foundation that allowed us to lead workshops in eight different South London Primary schools with three members of the band working for a full day. Most recently we have just finished a set of workshops and performances in Cambridgeshire Schools, through Cambridgeshire Music Service, with the full band which has been an incredible experience. 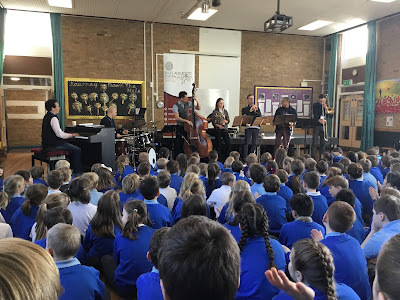 Alongside this we led a workshop before our performance at the Cambridge Jazz Festival last year and have recently completed a project with a Special Educational Needs school in London. We have been receiving amazing feedback from both pupils and teachers, and it shows that there is still an interest in jazz. It’s also been really interesting to see another side to the other members of the band and watching the attributes that they bring to the education side of the project. LJN: There is a hybrid thing of an educating band (for children) and a performing band (for paying adults) going on here. Is it easy for you as the main presenter to shift mode? EB: It’s not been too difficult. Obviously I have to watch my language a bit more when presenting a concert in a primary school as opposed to a late jazz club set! We haven’t altered the music at all and the reaction from young pupils (as well as teachers) listening to some challenging music has been really inspiring. We try to get the audience involved as much as possible in our performances and some of the primary schools have proved more raucous than London jazz clubs! I tend to lead all of the presenting when we play the evening sets but all of the members of the band give an introduction to one of the songs when we play in schools. Flavio has a brilliant knowledge of early jazz history and David has taken a particular interest in relaying the story behind Fables of Faubus and the 1957 Little Rock 9 incident during the first integration of schools. Pete Letanka is one of the most inspiring educators I’ve had the opportunity to work with – he has the ability to have pupils hanging off his every word instantly, and I've learnt a great deal from teaching with him. LJN: 22 April – what's going on? EB: We will be marking what would have been Mingus’ 96th Birthday with an evening show at the Vortex. I am hoping to make a Mingus birthday concert an annual event and there is obviously a big one coming up in four years time! We will also be performing at the Ashtead Jazz Club on 25 May. LJN: And you have something already booked in for the London Jazz Festival. Is it a new project? EB: Yes we’ll be doing our first project with Serious on the first weekend of the London Jazz Festival. We are still finalizing details but it looks like we will be leading a massed participation project with 60 pupils performing alongside our ensemble, hopefully at the Clore Ballroom at the Royal Festival Hall. Next year will mark 40 years since Mingus passed away, as well as 60 years since the release of Blues and Roots and Mingus Ah Um, and so we are planning more exciting performance and education projects to mark those anniversaries.